Teeth that are bright white are typically seen as an indicator of good oral health. If your smile is in excellent health, but your teeth are discolored, from diet and lifestyle choices, you may not feel that you are projecting the right image, for your own self-esteem and for your confidence in social and professional settings. If your smile could use a boost, Hughes Dental Group offers effective teeth whitening solutions in Campbell, CA. Teeth whitening or bleaching is an easy and comfortable way to boost the cosmetic appeal of your smile’s appearance, without repeat trips to the dental office or complex treatment plans. The active component of the teeth whitening gel used by our dental office helps to loosen and remove staining and discoloration on the surface of teeth. 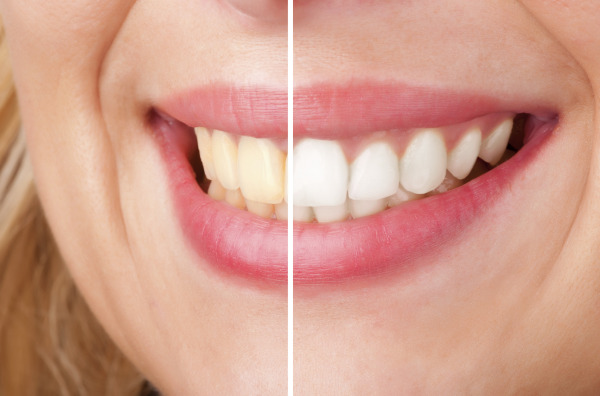 After teeth whitening treatment, most patients experience a smile that is about 6 shades whiter. Our professional whitening services are designed to be convenient for you. We offer both Zoom! teeth whitening as well as Opalescence. • Zoom!® Whitening – This in-office whitening procedure dramatically improves your smile in just one hour. The Zoom!® treatment includes a visit to our cosmetic dentists, where we will go through a few rounds of applying and removing a whitening gel that is activated by a special light. This process is comfortable and produces almost instant results. You can leave our office with an improved smile with only one visit. • Opalescence Take-Home Teeth Whitening – This home-use whitening kit is designed to fit the unique shape of your smile for the best efficacy of treatment. We take impressions of your teeth and use that mold to custom-make your teeth whitening trays. Because the trays fit your teeth snugly, the whitening agent stays exactly where it should and serves the most benefit. The severity of the teeth discoloration you are experiencing will dictate and how long and often you should wear your whitening trays. However, our recommendation for most patients is to use their whitening system for 30 minutes a day, for about two weeks. No matter which option you choose, you can feel confident knowing that you’ll be able to see a more radiant smile in a short window of time. At Hughes Dental Group, our Campbell, CA cosmetic dentists take care to recommend the product and treatment that will provide the best results for you. How Well Does Teeth Whitening Work? • Convenient – The teeth whitening systems we recommend for our patients are easy to use and can even produce same-day results. • Personalized – Your whitening system is tailored to fit your smile. One-size-fits-all whitening treatment doesn’t produce best results for anyone, which is why your teeth whitening trays will be made to comfortably hug your smile and keep the whitening treatment exactly where it needs to be. • Effective – Strips, toothpastes, and other popular methods of over-the-counter teeth whitening may never help you realize your dream smile. However, with cosmetic dental care from our experienced dentists, you can be sure that any treatment we recommended will help you achieve your goal for your dental concerns. Teeth whitening from Hughes Dental Group is safe and effective. Before beginning any treatment plan, we schedule a consultation appointment to help you determine the best way to care for your teeth. If you’re looking for a truly effective way to remove stains from your teeth, Hughes Dental Group can help you learn more about professional teeth whitening in Campbell, CA. Contact us today to set up your initial appointment.